Camping Hiking Trekking Backpacking Compact Folding Stove with Piezo Ignition. By Fire Maple Brand. 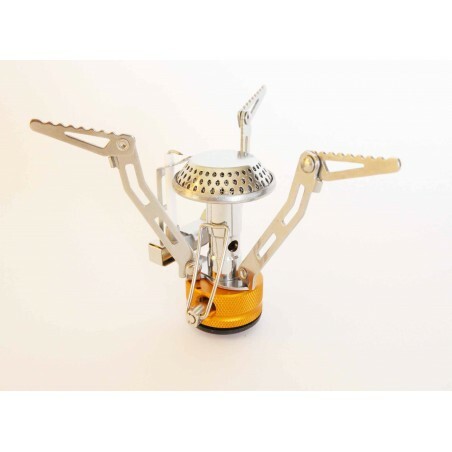 The Fire Maple FMS-102 folding stove is very compact and lightweight. Great for trekking, camping, hiking, backpacking and climbing. Adjustable fuel flow valve. Made of aluminum allow and stainless steel. Quick fire starts with the Piezo Ignition, no need for matches. Comes with small plastic carry case. Size: The stove uses a standard isobutane/propane mix canister you can pick up at local outdoor store. They screw onto the top of canister.Open 140 x 86 mm, Folded 60.5 x 88 mm. Power: 3050W. Weight: 132g.